Sagano first opened in its original location in Lincor Park in the summer of 2003. Back then, it was simply a Japanese Bistro, offering an assortment of noodle bowls, teriyaki and tempura dishes, as well as sushi. Being the only restaurant in Genesee County to serve sushi, Sagano Japanese Bistro gained a strong following, and flourished for about two and a half years until it expanded into what it is today. 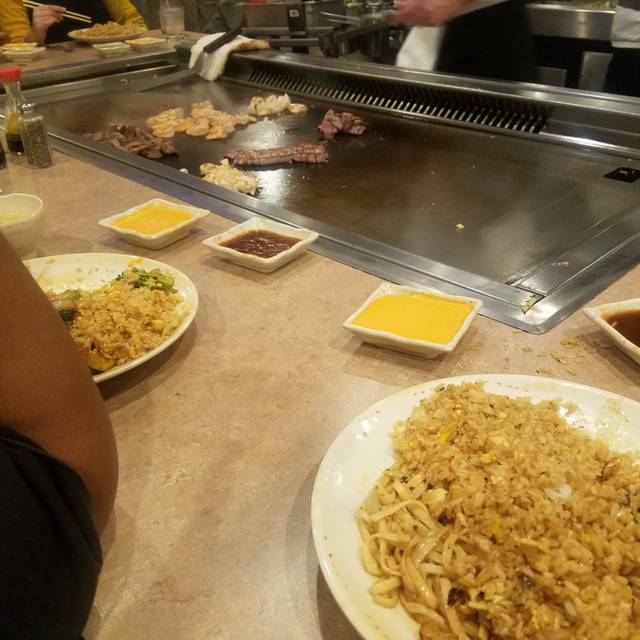 In December of 2005, Sagano Japanese Bistro and Steakhouse had its grand opening to reveal its new side and ten new Hibachi grill tables. Doubling in both size and capacity, Sagano has continued to flourish due to extremely loyal customers as well as those in search of some new tastes. 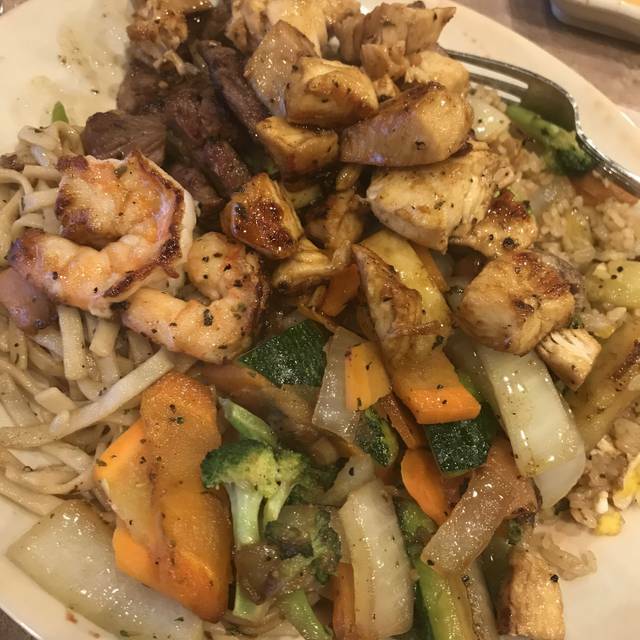 Sagano now offers a full grill menu, including chicken, shrimp, lobster, snow tuna, steak, and many others including combinations. We now have 5 locations throughout Michigan as we continue to serve the best in Japanese Cuisine. I would only recommend for the food I chose this place because I went with my sister for her grad dinner and it was nice!! So I decided to have my birthday dinner there and the manager/owner idk what he was host was very rude and mean and was all in my face I stayed because my friends came a long way but never again unless someone invite me!! The cook was great the waitress was awesome the food was delicious but the host and manager is very rude and I dont want to spend my money in an establishment like that!! Great meal out. Very entertaining dinning experience. Looking forward to going back. Well we showed up 10 mins before our reservation. Told them we reserved through OpenTable. He would not offer it since he got a big party in and said he was not honoring OpenTable reservations for the day. He told us 45min wait at least. He offered us a drink on him. We turned it down and left. Next time we are calling to reserve. Or go to a different Sagano. Unfortunately I feel bad for whoever used OpenTable that night as well. There should have been better communication between Sagano and OpenTable regarding that night. Of all the nights he said that night he was not honoring OpenTable. Hopefully this does not happen again. It isn't OpenTables fault on this one. The 1 Stars are reflecting the restaurant and NOT OpenTable. First time I have heard of OpenTable and used them. Very easy to use. Just If something like this comes up next time it would be nice for them to notify OpenTable and we can get an email or phone call update. Only 4 of us that went but what if it was 12-20 of us? How many restaurants could accommodate that many on a quick notice. Hopefully OpenTables reps can work something out with their clients regarding this issue. Such a great first time experience! We will definitely be going back! From the time we entered until the dining experience ended, the staff was welcoming, the chefs were entertaining, the food portions were generous and delicious! Will certainly return. Each time I enjoy it more an more. The chef I think it's Eric is hilarious! I brought my fam for birthday celebration, they'll be back. This was one of the best dining experience that we have had. We where glad we choose Sagano of warren on a very special day. Although making reservations for a large party makes no sense here. We had a great time once our party was sat. The food was awesome, portions are huge. Great Experience. Great Atmosphere. Friendly Staff. Would definitely return. Food was good. Portions were decent and most of us had doggie bags. If your hungry you will need to speak up or that extra portion you have your eyes on will go to someone else. Service on drinks was very slow but overall I would go back again. We went for mine and my sister in-laws Birthday. We had a great time. The chef was awesome. The staff was very friendly, professional and accommodating. While I enjoyed the entire experience I was disappointed that the steak was severely over cooked. Each person in our group ordered various degrees of doneness and none of the orders were correct. Considering you fall under the name of a steakhouse, it would help if they could be prepared correctly or please don’t ask. Aside from that, everything else was good. Great food. Service was great too but our chef was inappropriate at times, insulting and a tad pushy in trying to get people to participate in his games. I will go back but try to avoid him. Great service, entertainment and food. Huge portions and lots of food left over to take home and enjoy the next day. 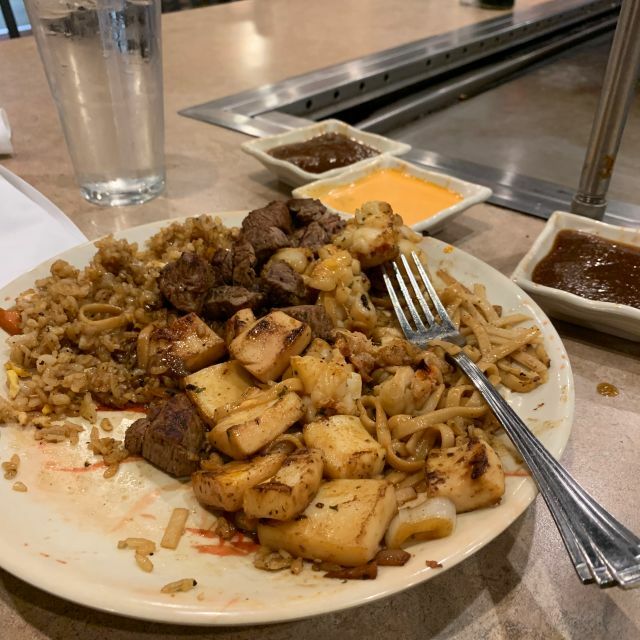 This was our first time and Sagano will definitely be our go to Hibachi place from now on. Had a group of 5 with a 6 year old. He had a blast. Food was amazing and their specialty cocktail was delicious! We drove here from Farmington and it was definitely worth it. Great restaurant and good food. Would definitely go again. Food was good and staff was accommodating to my vegan dietary needs. This location needs more help. Busy Thursday evening, reservation at 6, waited 25 minutes past our time for seating even though everyone was there on time for seating. No chef or waitstaff to service our table. Could not wait in the bar or get a drink because there was no bartender. Once we were seated service moved along quickly. Soup was meh, too salty like it was made with chicken bouillon powder. Main meal was fairly good, just not as good as the Brighton location. On the plus side our chef gave us a great show. Sushi, food and drinks were great! The service and the overall restaurant was fabulous! Food and chef were amazing! It was a bit pricey, but that is to be expected at a Japanese Steakhouse. The service was the only thing we can complain about. Our waitress put her thumb INSIDE every soup bowl she served. She brought our salad before we were done with our soup (for those at our table who chose to eat it). My husband had a beer and I had a cocktail. Our waitress never came back to our table after bringing our salads, therefore we were never had the option to order another drink. We will definitely go back because of the food and the chef, but next time I'm saying something if I see a thumb in my family's soup bowls. Like the value of the groupon. Didn't like being charged the extra $2.50 per person for the fried rice. Wasn't informed that was an extra charge. So when I go back I'll be asking for just the rice. The other party of 4 at our table complained and they removed it off the bill. Super good experience and very friendly staff! Definitely returning to this location. My family and I had a very good time I am very happy that we chose to go to this restaurant. We went for my brother's birthday and the staff and Chef did not disappoint we even brought a cake and they made the occasion super special and we had such a good time I would definitely go back and recommend my friends family co-workers the food was great and you're going to have a good time I was happy and my family was happy thank you guys. We went for my moms birthday and had an excellent meal. I have celiac disease and was nervous about eating here, but they ended up preparing my food separately in the back and brought out a generous plate of meat and veggies, plus a bottle of gluten free soy sauce! I was impressed and very satisfied! First time there and ate in the Bistro. Did not try the Hibachi yet. Staff was friendly, food was good, atmosphere in the bistro was quiet. Prices were good for the amount of food served. I'll go back. Very good presentation by the Hibachi Chef. Fun was very good, and plentiful! That was me and my husbands first time there and we really enjoyed the service, the food. It is well worth the money you’re gonna spend. First off, whats the point of making reservations online when they don't even put it i? Then the workers and THE MANGER is so rude they walling away while your trying to talk to them. Then when i get there they couldn't find my reservation and they tired to sit me at a table saying i can just order from there(but gave me no menus) then after waiting for 15-20 mins i went back to the front to ask the lady and she said no you can order but i was sat there to wait 30-45 mins to be placed at a table. When i got a hold to the manager he confirmed that my reservation was never put in online after i showed him my email confirmation he walked away and never returned. Speaking rudely to me and my spouse we will NEVER return to this place. 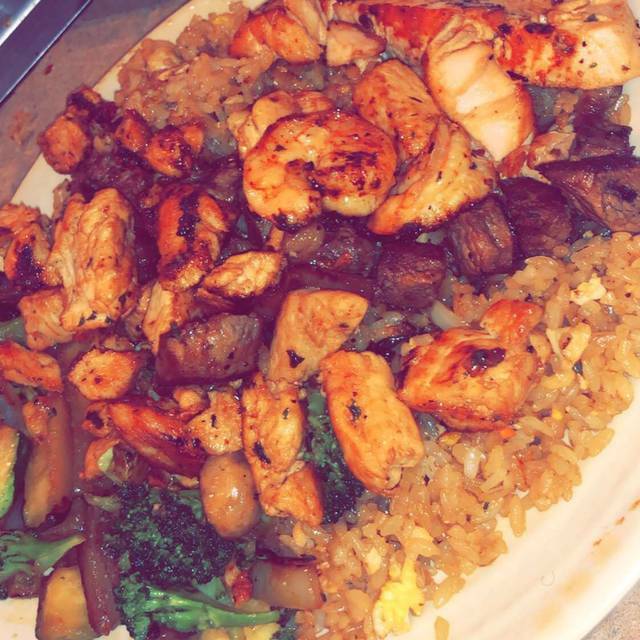 We did hibachi and it was great, we met some cool people and had great conversation, the chef was colorful and awesome with his cooking techniques, we will definitely go again.